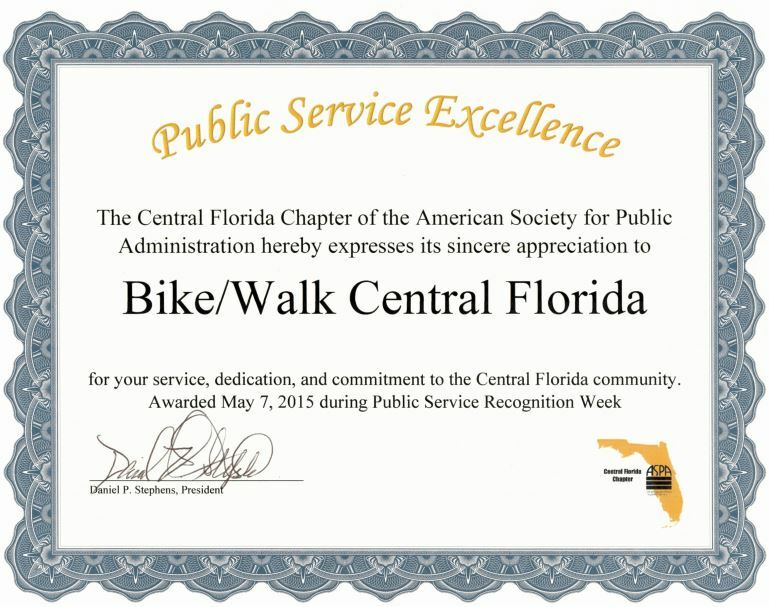 Big thanks to the Central Florida Chapter of the American Society for Public Administration (ASPA) for honoring Bike Walk Central Florida (BWCF) with their Public Service Excellence award! The award highlights public organizations that excel in promoting the role, ethics, and ideas of public administration. BWCF was recognized for our work to educate all road users — pedestrians, bicyclists, motorists, and transit riders — about Florida’s road laws. The best part? This award spreads the word about BWCF’s mission to the very people who can influence future transportation planning and design in our community. A big shout out to bicycle and pedestrian advocate extraordinaire, Daniel Stephens, president of the Central Florida Chapter of the ASPA, who nominated BWCF for this prestigious award.